The greening movement as it pertains to consumer choices. 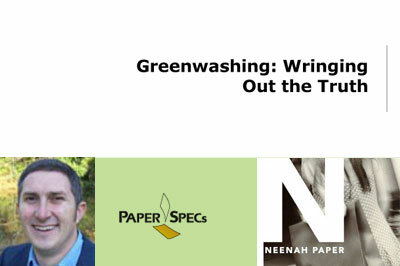 Yesterday, design and print resource, PaperSpecs put on a great webinar called Greenwashing: Wringing Out the Truth. Presenter Scot Case of TerraChoice Environmental marketing Inc. outlined the 6 sins of Greenwasing while giving a brief summary of the greening movement as it pertains to consumer choices and subsequently designers’ paper choices. I’ve attached the handout (with my notes in red) from the session so hopefully you’ll find something useful there. The Benefits of being a "Triple Threat"
We Wanna Give a "Shout Out"